Nice feedback everyone. That's the spirit! If you have questions for next week, please email us now and we'll do our best with everyones help to produce an answer based on hearsay of your nosey neighbors. Please email us today at la@curbed.com with your new questions, or updates. 1) Sherman Oaks: In answer to the question regarding the plans for Westfield's Fashion Square we can point you to the project's draft Environmental Impact Review which features everything you could ever want to know about the project (except tenants). 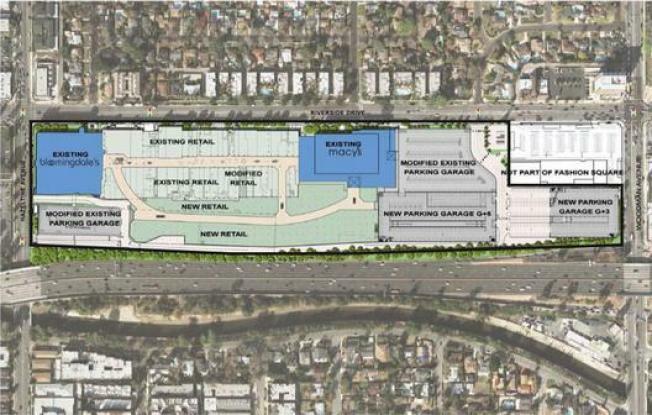 Via the project description: "The project involves construction of 280,000 gross leasable square feet (GLSF) of new retail/restaurant commercial space and additional structured parking..."
2) Glendale: We have no status updates on the Verdugo Gardens project in Glendale. It was approved in February of this year. We need to drive by and see if anything is happening at the site. 3) Hollywood: The handsome buildings on Cosmo appear to be recording studios, say the commenters. "...the Cosmo st buildings are recording studios. There's all sorts of little music places like this in the area, mostly Mom n' Pop shop operations that've been round for quite some time. Think one of these locations was called Hully Gully Studios at one time..." The one on Gower requires a bit more research. We're giving this duty to the intern.